Edna Forehand Bissette, 92, peacefully passed away on Sunday, November 11, 2018 at Kitty Askins Hospice Center surrounded by her family. Born in Wayne County on January 12, 1926 she was the daughter of the late John Edward Forehand and Ida Howell Forehand. A service to celebrate Edna’s life will be held on Wednesday, November 14, 2018 at 7:00 p.m. in the chapel of Seymour Funeral Home with Rev. Danny Smith and Rev. Harold Jones officiating. The family will receive friends following the service at the funeral home and at other times at the home. Burial will be Thursday, November 15, 2018 at 10:00 a.m. in the Pikeville Cemetery. 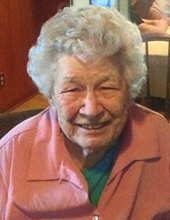 Edna is survived by her husband of 75 years, Paul Bissette; daughter, Gail Barnes and husband Jerry of Pikeville; sons, Edward Bissette and wife Janet of Clayton, David Bissette of Pikeville, Randy Bissette of Pikeville, Ernie Bissette and wife Lorelei of Greenville, and Adrian Bissette and wife Christine of Charlotte; nine grandchildren and nine great-grandchildren. In addition to her parents, she was preceded in death by her sons, Tim Bissette and Christopher Bissette and four sisters. To send flowers or a remembrance gift to the family of Edna Forehand Bissette, please visit our Tribute Store. "Email Address" would like to share the life celebration of Edna Forehand Bissette. Click on the "link" to go to share a favorite memory or leave a condolence message for the family.